All five variations accomodate five cars on one siding, three on the other two, and the loco plus three cars on the headshunt. I did not arrange the cars properly in every picture, but did test the lengths to see that they would fit. 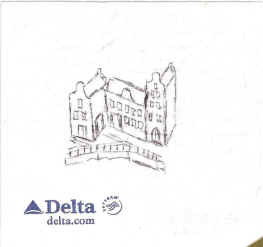 The sketch below right shows that great ideas really do often get their start on a napkin (serviette to you Brits). This was on a flight from the Netherlands back to Atlanta. 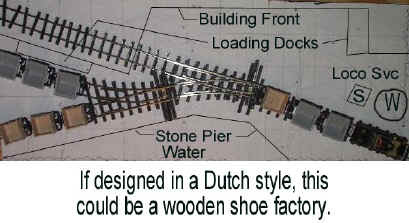 3/22/04 Thanks to Ruud Witenkok, of the Netherlands (check out his web site by clicking on these words), I now have some authentic Egger-Bahn decouplers. And they actually work pretty well! So, there is no excuse for not proceeding with this project. Below is the decoupler. 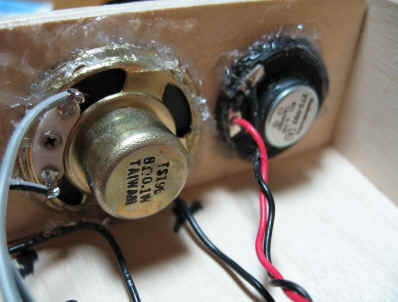 The ramp pivots on two wires and is actuated by a solenoid in the black box. The yellow thing is just to hold the ramp up for the picture. I think that I shall have to do some work to conceal the solenoid - perhaps find a way to invert the box below ground level. 9/7/04 Well, I finally got some work done! This is just a test layout; but you can see three Egger Bahn electric uncouplers and two Shinohara code 60 turnouts in an Inglenook arrangement. The turnouts are operated by old Atlas switch machines mounted underneath. 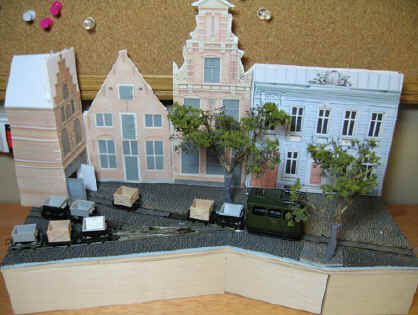 Everything is held in place on the foamcore board by double sided tape. The good news is that it all works pretty well. I do think that shrinking this to shoebox size is going to take some real tinkering, though. The Egger Bahn uncouplers are remarkably reliable, but occupy considerable length of track - length I won't have in a shoebox. 2/20/05 Martin Ket sent an excellent suggestion: Use one uncoupler located on the switching lead and tilt the layout so that cars, when uncoupled, roll into the yard tracks by gravity. this saves length on the yard tracks. Sounds like a hump yard! 10/11/06 After quite a long time, I'm really working this layout now. The Egger-Bahn uncouplers worked fine, but their coils, mounted on the top, were too big and in the way. I finally obtained some REPA/Uhlenbrock uncouplers that mount under the layout and found that they work equally well. After some further experimentation with uncoupler location and track lengths, I found that the Inglenook pattern would fit in Carl Arendt's "standard shoebox" of 13" x 5". 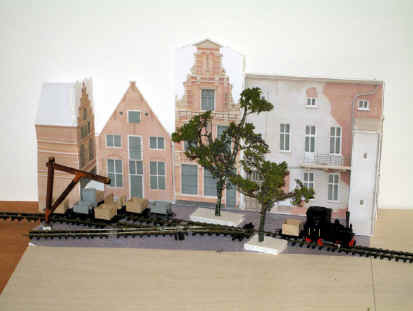 At the right is a mockup with Dutch canal buildings, a couple of trees, and a jib crane (not supported properly. 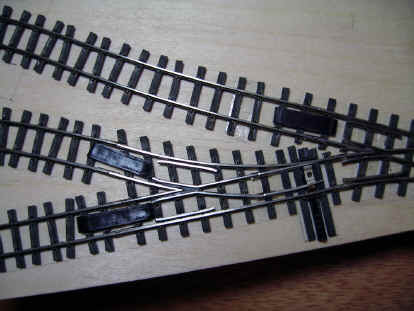 Directly below is the actual track layout on the cut-to-size baseboard. 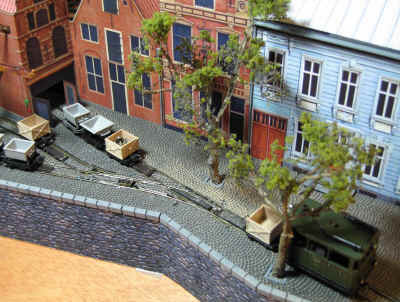 The front edge will be a canal wall. Below right shows the Atlas switch machines and the three REPA uncouplers. 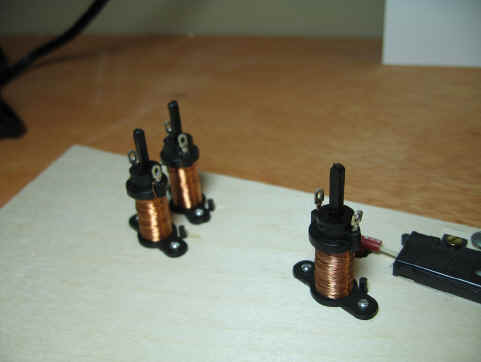 Second picture below shows the three REPA uncouplers with their vertical actuators installed and adjusted. They require about 1.5" clearance below the baseboard. Second picture below right shows the REPA uncoupling ramps. I've cut two of them to a shorter length, and will cut the third as well. The length is not needed with the tiny Egger-Bahn cars. 10/13/06 The wiring to the uncouplers and switch machines is done and a small control panel has been created. 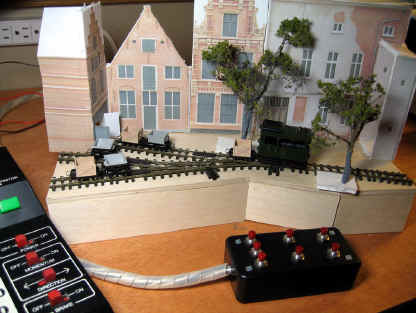 The control panel is on a cable attached via a connector on the back of the layout. Hopefully this will prevent jostling the layout too much when pressing the buttons. Here's a picture of Firey Elias ready to switch some cars. 10/18/06 The Faller "Roman Cobblestone" paving is in place. This is a plastic foam product which is pattered on the top surface. It is very easy to mark by pressing it gently on the rails and cuts easily with a sharp X-acto knife. 12/23/06 The layout is nearing completion. 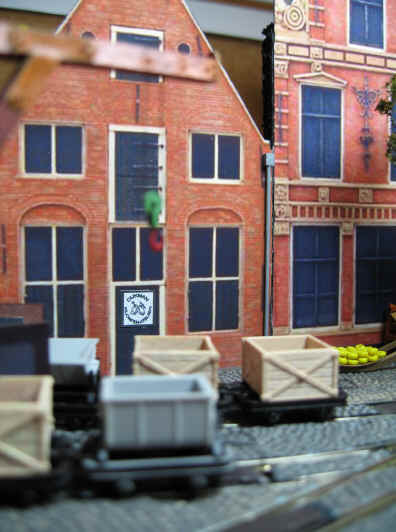 These pictures show the final printed buildings, to which I have added some details such as lifting beams, downspouts, and front steps. The canal wall is complete and the trees have been properly "planted." 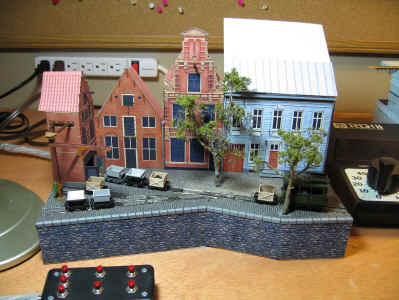 The roofs are not final, and I still want to have a barge and some water in the foreground. The best part is that the Firey Elias and the tiny Egger-Bahn cars operate very reliably, although I did have to replace the Egger-Bahn wheels with their too-large flanges with wheelsets from MicroTrains trucks. 1/6/07 The Cheese Shop ('t Kaaswinktje) has a sign and some goods for sale. 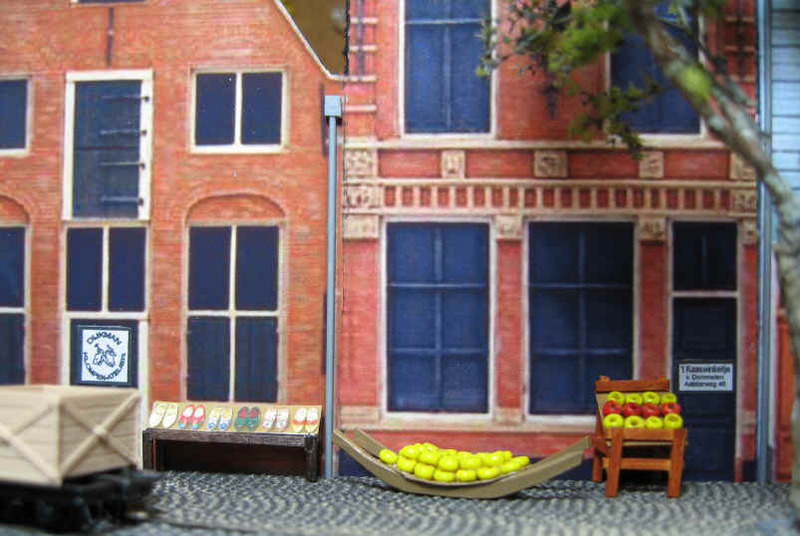 The pallet of Gouda has just arrived, and wheels of Gouda and Edam are displayed by the door. The wheels of cheese are made from 8/0 glass beads from Hobby Lobby's bead department. 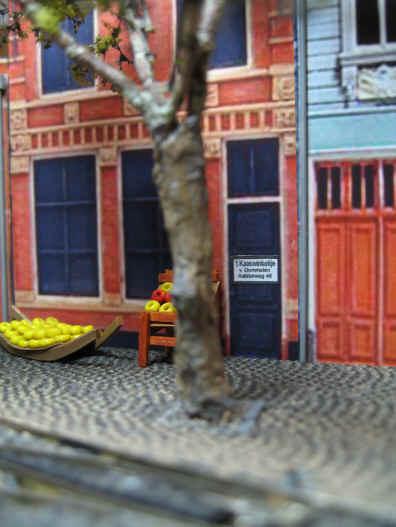 Dijkman's Wooden Shoe Factory (Klompen-atelier) has a sign and a display of their products. The railroad will be delivering some materials soon. 2/5/07 Adding sound to the layout required speakers, of course, and since I have two separate sources, one at speaker level, makes them difficult to mix. So, I just added two sets of speakers, one for ambient sound and one for the locomotive sound from the MRC Sound Box: Steam. 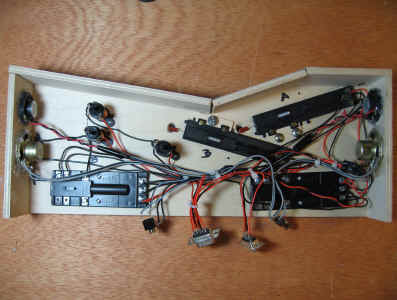 At the right is the underside of the layout with speakers, switch machines, uncouplers, and power routing relays (Atlas Snap Relays) all hooked up. The smaller pair of speakers are Radio Shack 1 1/8" mini-speakers, but when I decided to add the second set, I found some 1 1/2" speakers at the local electronics house. 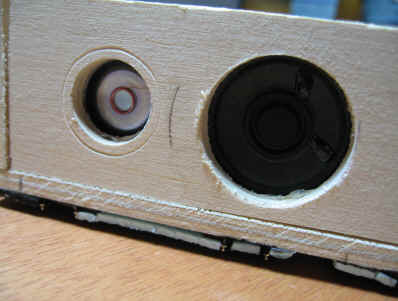 Below are closeups of the speakers, inside and out. Silicone sealer is holding them in place.